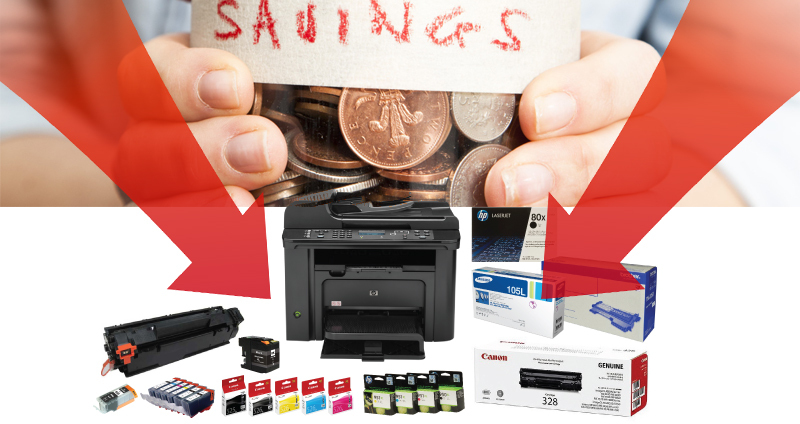 Are you paying more for printer ink cartridges and printer toner cartridges? Some people pay more for an inkjet/toner cartridge than an entire printer. As you may know most printer manufacturers like Hewlett-Packard Company (HP) and Canon have adopted the same marketing model as razor blade companies. For example, they will sell the razor at a very cheap price and even at a loss but then make money of the blades with a bigger margin. The same applies to printer manufacturers as they will sell their inkjet printers or laser printers at a loss, and make their money back from when you buy their genuine original (OEM) cartridges. However, you do not have to fall into that trap and buy the OEM cartridges as here at www.inkntoneruk.co.uk we can show you various ways of reducing printing cost quickly and therefore having a bigger saving for when you do printing. Printer manufacturers will do all they can to convince consumers that third party cartridges e.g. compatible cartridges or re-manufactured cartridges are inferior and not reliable as their branded cartridges. They will go as far as saying that the compatible cartridges will “break” the printer if you use them. They will throw at you all the scare tactics they can as they need to recover the cost of the printer that they sold to you by getting you to purchase the cartridges supplies. 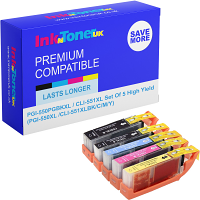 Buy Premium Compatible Ink Cartridges | InknTonerUK offers two types of compatible ink cartridge. They can either be a brand new copy made by a third party or a remanufactured cartridge depending on what type of printer you have. You will generally have good luck with compatible cartridges as the quality is very good and they generally last longer than the original ink cartridges. Buy Budget Compatible Toner Cartridges | These are new build cartridges manufactured by third-party that meet or exceed your expectations. Again, with these budget compatible cartridges you will generally have good luck with them as the quality is very good and they generally last longer than the original toner cartridges. Buy Premium Remanufactured Toner Cartridges | If you are looking for the highest quality compatible that you can get then the remanufactured cartridges is your best bet. These premium remanufactured cartridges are tested to verify that they perform exceedingly well and they frequently cost a fraction of price you pay for new original cartridges. Buy Multipacks or Twin Packs (Value Packs) | Combine the savings by buying more than one cartridge e.g. a whole set of cartridges or a dual pack in order to save more money. That is one of the best way to save on printing costs. Replace the Toner Cartridge Drum | If the toner cartridge does not make good quality prints, then replacing just the drum can be less expensive than replacing the whole cartridge. Buy in Bulk Quantity | If you use a substantial amount of ink or toner; buy it in quantity. The more you buy with us of the same cartridge the more you save as we offer quantity discounts on all cartridges. While all of these tips can help you save money on printing, the biggest money saver of all is buying ink and toner cartridges from us at www.inkntoneruk.co.uk as we offer a Price Promise Guarantee that our prices are the lowest you can get online for any type of cartridges. With us you can buy new original cartridges, if you want, or buy third party compatible or remanufactured cartridges. Ordering with us is very easy and finding the right cartridges for your printer is very simple. So what are you waiting for? Start saving money on printer ink and toner cartridges by shopping with us by clicking this link here!